During the last years the damage we have caused to the environment has been enormous and the concern begins to increase due to the irreversible damages that we have caused. Proof of this is the creation of the Stockholm Convention on Persistent Organic Pollutants; this global treaty aims to protect human health and the environment. Persistent organic pollutants are those products that remain intact in the environment for a long time, are distributed all over the world and are toxic to wildlife and humans. That is why all countries that are part of the Stockholm Convention must commit themselves to take measures to eliminate or reduce these contaminants. In addition, they undertake to perform cleanings of dumps such as those of the tires. All this leads us to reflect on the relationship between transport and the environment. Transportation has given us many benefits and facilities in our daily lives. However, the benefits are reduced by the harmful gases, toxic wastes and materials that are eliminated daily around the world creating huge piles of garbage that emits toxic gases, with no other use to wait. Wait for time to pass and slowly degrade for hundreds of years. This is a wakeup call. Just blame it on and think that it does not exist won’t help us anymore. The pollution produced by tires is real so we must create social awareness to recycle tires and not left them in the dumps or oceans for years. The big problem with tires is that many of them are burned outdoors which causes the release of toxic gases that contribute to global overheating. In addition, the remaining ashes are distributed in stockpiles or left in the same place where they were burned. This causes that these ashes are carried to other places by the wind or rain, polluting the air, water and earth in its passage. Burning tires outdoors does not help the environment, on the contrary is the worst thing we can do. Burning tires produces air pollution that affects living things that breathe that air, affecting your immune system, causes asthma, in addition to other respiratory diseases, lung cancer and also cause skin infections. Recycling is an activity that will improve our home, city, country and the world. Let us remember that with small actions in our daily life we can create significant changes. Tires have thousands of uses, we need to do more recycling of tires in California because if we do not take seriously that we must recycle tires our dependence on oil will be greater. Also, garbage dumps would grow considerably. And the tires will begin to invade oceans and cities that will end up affecting our health considerably. Remember that recycling is to practice responsible consumption, to improve our environment and therefore our health. The advantages we have of recycling is that we save energy which generates less CO2, which reduces the greenhouse effect causing global overheating; we use less raw materials which will lead to the preservation of natural resources; we manufacture necessary products from the waste and the creation of new trends like eco-design gives us thousands of possibilities for recycling. Also recycling creates employment and activates the economy. Like Globarket that bring jobs to American people and help the environment. Our company is made up of people committed to the environment, who spend a great part of their time to make actions that help reduce the impact to the world, such as diverting waste tires from the landfill to our facility. 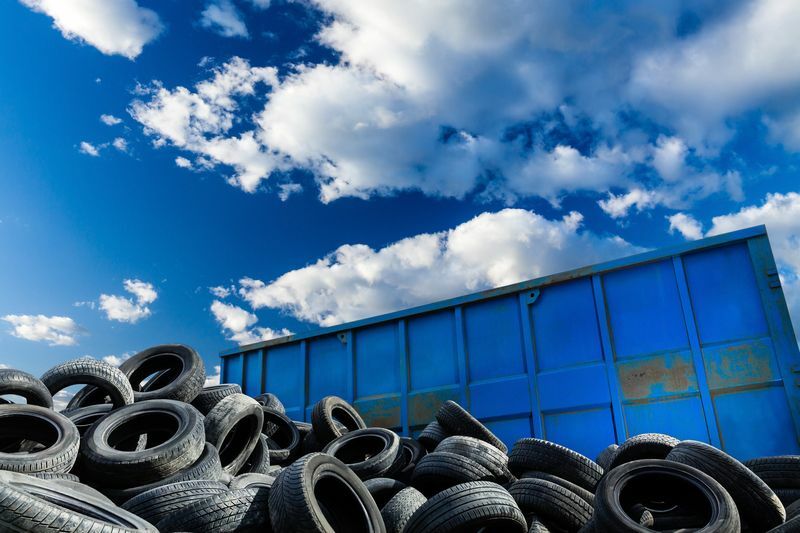 Our company is responsible for the recycling of tires in California; we have a tire recycling plant that can process scrap tires, so people can deliver the tires in our plant with an appointment. Changes begin with oneself. For this reason we started doing the recycling of tires in California State. In the future our goal will be to recycle millions of tires from all over the United States and even from other countries like Mexico, since the border is full of tires, which end up as a wall between the two countries, affecting the health of all people and animals that lives in the region. Furthermore, it represents a latent danger if it accidentally creates a fire because the toxic gases could cover large areas of land affecting all its inhabitants. We invite you to join our recycling of tires in California movement to take care of our environment and create new products through tire waste. With tires, we can create different products that are necessary for our daily life (while helping the environment) as: derived fuel used as a fuel in some factories; derived aggregate used to fill ground in constructions; rubber mulch and buffing used for landscaping and residential areas; granulate to do the base of some products like highways or the floor for some playgrounds; and, infill material which is similar to granulate and is used for sports fields and other products such as industrial facilities, roads and trails, gym floors, street cones, industrial safety articles, among others. If you want to deliver tires at our plant, we are located at 2580 Progress St Vista California, 92081, USA, contact us to schedule an appointment and have more information about this service. In addition, if you have doubts about our products or services we will be honored to serve you. Call us at (001) 760 599 3841 or write us at hello@globarkettire.com.